Google views certain content on the page as more important based on where you place it. The items with a higher weight are page title, headings, and URL. So you want to make sure in particular that your keywords are at this level. It is also sometimes called the title tag. A HTML tag is a code surrounded by brackets that denotes format, hyperlinks or information for the bot. The page title or title tag shows up in a couple of places. It is visible at the top of the browser. It is also the clickable link in the search engine results. Here it is “Chocolate Donuts |Mary’s Bakery.” It includes the keyword and also lets users know who is selling the donuts. Meta is a type of HTML tag that gives information about the page. The bot can see this information in the HTML, but the user can’t see it on the page. Users can see it on the search engine results page below the clickable link. Here’s what that looks like. It is not a factor in determining your rankings, but can help persuade users to click on your link versus another one on the first page. 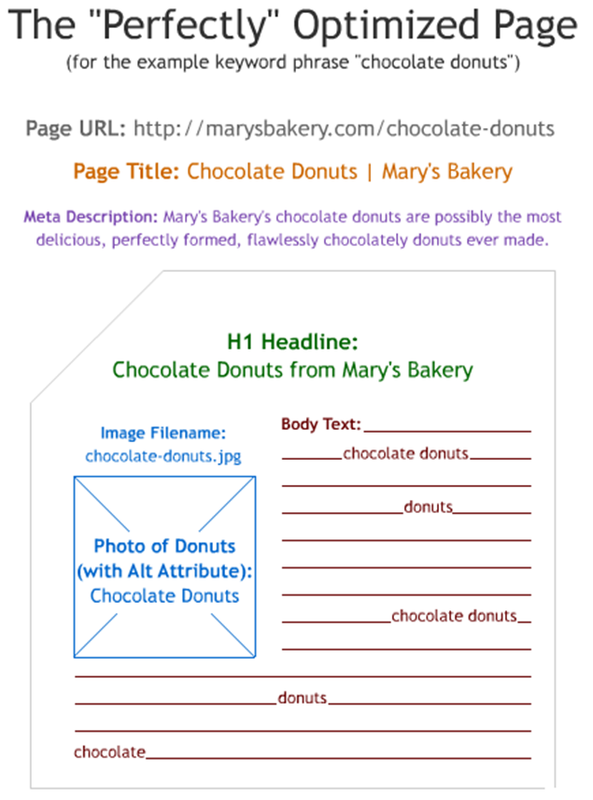 It also, includes our keyword “chocolate donuts.” Google recognizes the HTML tag “H” and then the number, such as H1 or H2 as the heading tag. This is the one you want to use in the HTML when you build your page. You’ll notice the keyword is also sprinkled throughout the body content, with a few variations to allow for users variations in the query and for natural writing. The keyword is also included in the image file name and alt attribute. The alt attribute, or alt tag, specifies alternative text when the element to which it is applied cannot be rendered. So if an image can’t load in my browser, I will see this text. It’s not going to provide the same weight as text, but it is how Google can read your images. This entry was posted on Wednesday, September 15th, 2010 at 9:10 am and is filed under Marketing. You can follow any responses to this entry through the RSS 2.0 feed. You can leave a response, or trackback from your own site. SEOmoz is a great resource overall, so I definitely recommend you check it out if you are interested in SEO!